I was getting an early listen to the new album Transference, set to be released January 19, 2010 by Austin, Texas band Spoon. I was really feeling the album and decided to do a little research and see what I could come up with for a post. You see, I just didn't know much about Spoon, and wanted to familiarize myself with them if I was going to write a post about them for you. I was surprised with all the things I learned. For example how the band is loved for it's music as well as its perseverence in the face of major label abandonment. In 1996 the band released it's first full length release Telephono. It was loved by fans and critics alike. Then these Indie heavyweights get courted by the label Elektra Records. 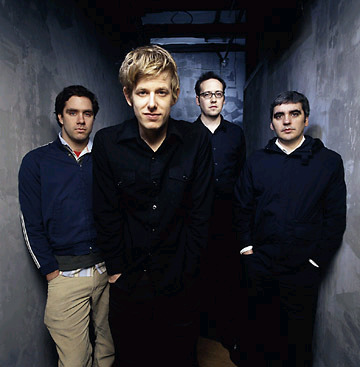 By 1998, Spoon's Elektra debut is brought out into the world to hear. A Series of Sneaks was also well received by fans and critics, and was considered a big creative leap for the band. Sadly, this album did not sell fast enough for Elektra, and the band was dropped from the label. Four months after the album release date. Fascinating information right? Yup. But I want to tell you about Howie Weinberg. But discovering that the band was using Mr. Weinberg to master the album, I thought that was something special. Mastering always used to sound like a cakewalk of a position. You just make it sound better and coherent. How hard could that be? It's hard. I got into some mastering work before, and it's painstaking work. Also coupled with the pressure that you are the last person to lay hands on the music, a lot of blame can get dropped on your head. Howie Weinberg is the best in the buisness. I think you can tell on Transference how well that album moves from track to track and how great each indivudual track sounds. With a resume that looks like a selection of all my favorite albums and artists (Nevermind, The Mars Volta, Public Enemy, Muse, Modest Mouse, 3 Years, 5 Months & 2 Days in the Life Of..., Licensed To Ill) it's probably not a bad guess that the bands and albums he works on will come out platinum on the other side. On behalf of Merge Records and Spoon, we would kindly ask you not to post copies of "Transference" on your site (or any non-preview tracks from Spoon's new album - street date 18th Jan UK /19th Jan US). We do appreciate that you are fans of / are promoting Spoon, but the label and artist would greatly appreciate your co-operation in removing your links to the pirate files in question. Thank you for respecting the artist's and label's wishes and, if you / your readers want good quality, non-pirated, preview tracks, then a full length version of "Written in Reverse" is available for fans and bloggers to post / host / share etc at www.npr.org/templates/story/story.php?storyId=120830261&ps=bb2 ... .. for further details of the new album, on-line promotions, videos and 2010 shows, check-out the band's official site at www.spoontheband.com and keep an eye on official sources for details of further Spoon news, preview material and on-line promotions. As a special, New Year's gesture to fans and bloggers, an exclusive preview stream of the full album is now available via NPR Music's Exclusive First Listen series at www.npr.org/templates/story/story.php?storyId=122279793 ... .. this is for hyper-linking ONLY and for streaming by fans directly off NPR, so please reciprocate this goodwill gesture by NOT ripping or embedding these files. and remedies remain strictly reserved : please excuse this required formality. all right Sheriff. you got me. I'll take it down. "Come Out With Your Hands Up" !! Thanks again for respecting the band's and label's wishes. PS: Evil will always prevail.